Conflicting Webs had a little too much going on for me. There are two very major story lines - which do overlap and interact nicely - but I felt like I neve really got to focus on one or the other. In one story we have the April and her wedding - which seems destined to be sabotaged. If it can go wrong - it seems like it will. 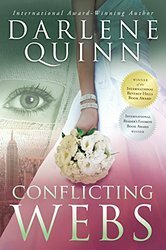 From accidents to the flower girl's birth mother trying to steal her away. A lot of the story revolves around this mother and her attempt to ruin Kyle and April's life while trying to start over with her own. Her story was actually my favorite part of the book. It was gritty and real, a part of life not everyone (thankfully) gets to see everyday. On the other hand - and I'm going to be vague here to avoid spoilers - we have a horrible accident and some deaths that really made me want to cry. While her story was touching - it seemed like it was there to create more drama and have a few influences on the other story line. It never quite seemed complete somehow. This was not my favorite of the series. Too much going on that meant I had a hard time really connecting to any one part of it. But till a good story.